Everyone has goals in life. Yours might be to get a better job or promotion. It might be a personal goal to make self improvements or changes. Maybe you have the desire to meet someone new or maybe improve your current relationship. 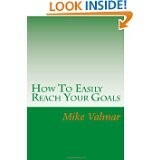 "How To Easily Reach Your Goals" explains just that. I give you suggestions and discuss the outcomes. I show you how to be a better you. Also in this book, I discuss how to better "read" people to obtain your desired goal. I have packed years of research into this book, and I know it can help you be the person you truly want to be. About the Author Retired Fireman now a certified hypnotist. I have always been a "people person" and try to help people where I can. I have made it to where I am by setting goals. Goals in my personal life as well as in business. Not only do I explain what goals are but I show you how understand them better. How to use them in everyday life. How to achieve what you desire and how to be a better you. * Item also available in a paperback version.